We have a large assortment of critters to bring your party to life. 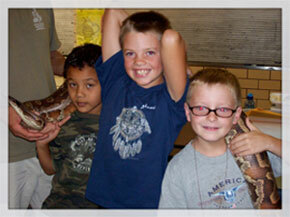 Each party will be introduced to a range of reptiles, arachnids, and amphibians from there CRITTER COTTAGE. These critters will astonish as well as educate everyone attending your party. 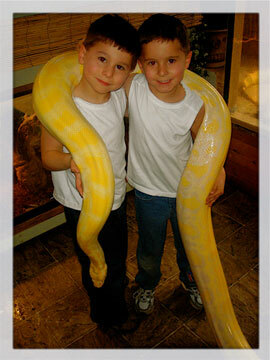 With such a large variety of reptiles, it's never the same show twice. All the critters are able to be touched or held, by anyone curious enough.We will be showing the proper and safe way to handle the different critters. We have fun while being safe and sanitary. We provide sanitizer to disinfect your hands after touching of the critters, to emphasize proper hygiene. And of course there will be plenty of photo opportunities with all the critters. And a family portrait with the big snake. Call 303-642-0690 to book a party. We are insured and licensed for your protection and ours. And remember your party helps support our rescue. Shows are $175.-$250. for the first hr. and $50 for each additional 1/2 hr. Our typical party is an hour long, with around 8 critters. Longer shows with more critters are available. Exactly what we bring we don't know until the day of the show, so we can check there temperament and see who's shedding. But we always bring at least one snake over 6', a large lizard , a small snake and a tarantula. With over 20 species in our rescue we bring a pretty good variety of critters, some of which you may have never seen before. If there is something in particular you're interested in we can certainly try to bring it. When showing the critters to the kids, they get to hold all of them as we tell them about each critter and there characteristics.